Nose down, Talk Show Man holds off Paris Vegas to win the Henry S. Clark Stakes at Pimlico. Photo by Laurie Asseo. 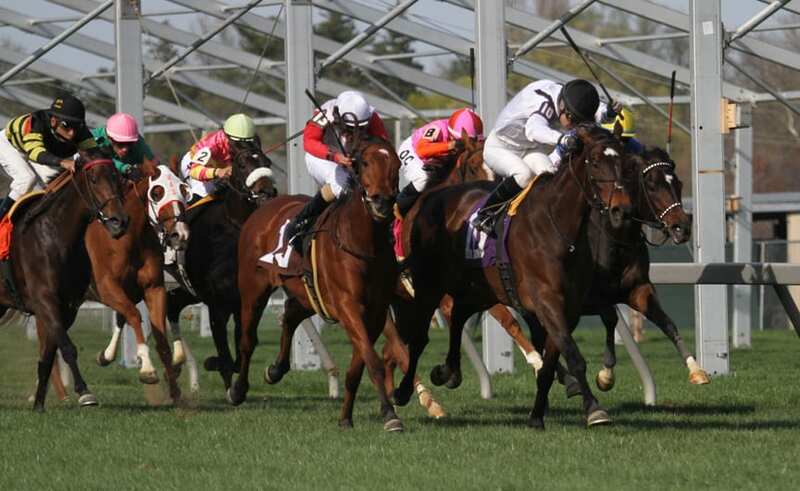 “Part of the training is trying to find your horse,” trainer Jose Corrales said in the aftermath of Bodhisattva’s victory in Saturday’s Federico Tesio Stakes at Pimlico. Of course, his horse wasn’t so hard to find; he was the one on the lead most of the way and, after repelling a stiff challenge from Noteworthy Peach, the one under the wire first. But Corrales’ larger point — that it’s not so simple as getting your horse fit and then putting them in a race — is one that could have applied equally not just to Bodhisattva but also to Dahlia winner Nellie Cashman and Henry S. Clark winner Talk Show Man. Though the three Pimlico stakes winners received — and were deserving of — considerable respect from the betting public, all entered their races with something to prove. Bodhisattva — an enlightened being, in Sanskrit — had the most to learn, and prove. Despite four tries in stakes company, he had just a single stakes placing to his name. 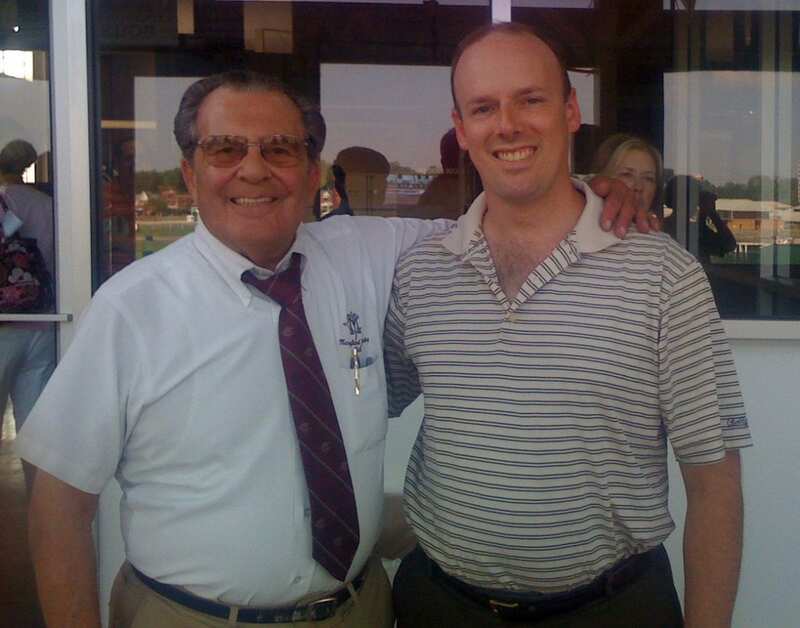 He’d led thoughout the Miracle Wood, in February at Laurel Park, and fought on gamely to the wire — but ended up fourth, though beaten just a half-length. Then, in Laurel’s nine-furlong Private Terms, he had vainly chased loose-on-the-lead Bridget’s Big Luvy around the track, settling for second by 2 1/2 lengths. Part of the process of finding this horse, he said, had been using a battery of different riders: one to break him, then another to gallop him. “Then finally I changed to another rider who can ride him in like a dressage way to change his behavior a little bit better,” the trainer added. The mental side of the game was equally important for another talented, improving runner Saturday: Talk Show Man, who scored a narrow victory in the grassy, one-mile Henry S. Clark Stakes and is now pointed to the Grade 2 Dixie on Preakness weekend, according to trainer Hamilton Smith. The Maryland-bred son of Great Notion had shown new life when put on the turf last April, running second to next-out Grade 1 Arlington Million winner Hardest Core in the Cape Henlopen at Delaware Park and then, two starts later reeling in fan favorite Ben’s Cat and two-time defending champion Roadhog to win the Maryland Million Turf at one mile, the same distance as the Clark. But in his next race — back on the main track in the Richard Small Stakes at Laurel — Talk Show Man, in tight near the top of the lane, fell heavily. He didn’t race again for four months. Nellie Cashman (inside) holds off Run of the River to win the Dahlia. Photo by Laurie Asseo. Talk Show Man returned to action with a flashy score against allowance foes at Laurel, winning a one-mile main track race by five lengths while recording a career-top 102 Beyer. But some questioned how that race — in which he had a perfect setup while on a different surface — would translate in his return to stakes company. Midway on the turn, the answer appeared to be negative; Talk Show Man seemed to be spinning his wheels. But jockey Xavier Perez finally found a spot inside, and given a narrow seam, Talk Show Man burst forward to win a head-bobbing finish with Paris Vegas. It was a good outcome for a horse who seems to be all the way back after the frightening events in the Small. 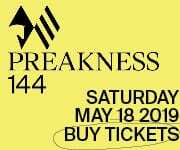 In the Dahlia, a race sometimes used as a prep for the Grade 3 Gallorette on Preakness weekend, the tinkering with Nellie Cashman was perhaps more physical than mental, said trainer Tres Abbott. But the result was similar: a nose victory in the one-mile turf test, this one over Run of the River. 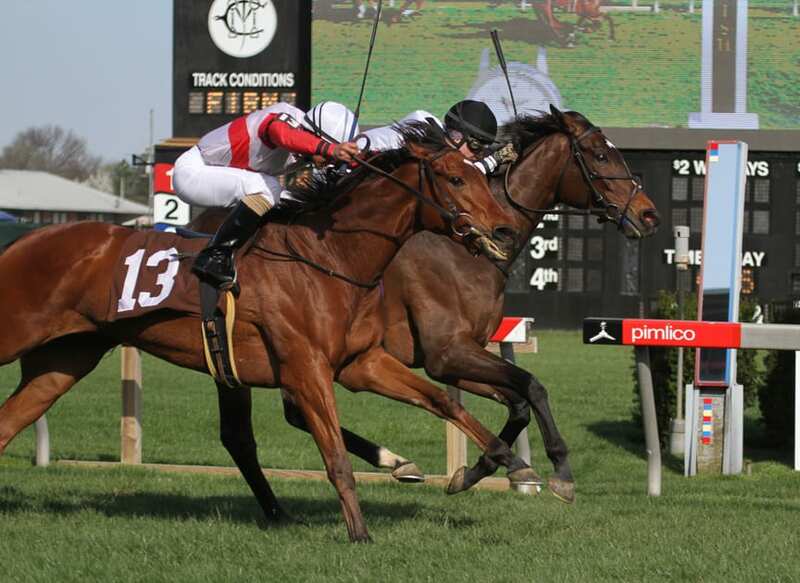 In the Dahlia, Nellie Cashman, whose other stakes victory came in the Grade 3 Virginia Oaks in 2013, stalked the pace of favored Istanford, took over leaving the furlong grounds, and narrowly held off late-running Run of the River. Unlike the earlier winners, Abbott said he isn’t giving too much thought to returning on Preakness weekend. All of that, of course — for all three runners — is in the future, and what the future looks like in horse racing is always hazy, always uncertain. All you can do is try to get your horse fit, and happy, and ready to run, and hope for the best. First time by in the Dahlia. Photo by Laurie Asseo. 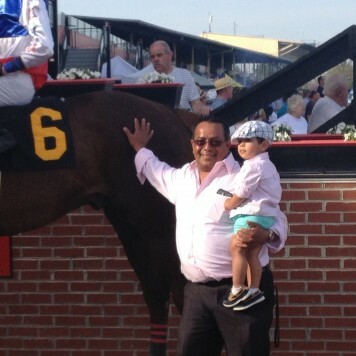 Jose Corrales and son Pachi after the Tesio. Photo by The Racing Biz. 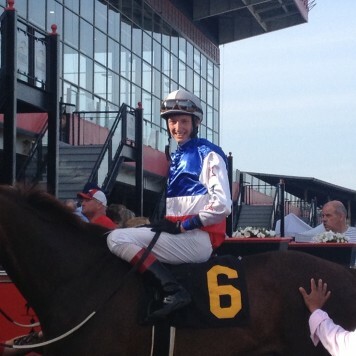 Trevor McCarthy all smiles after the Tesio. Photo by The Racing Biz. 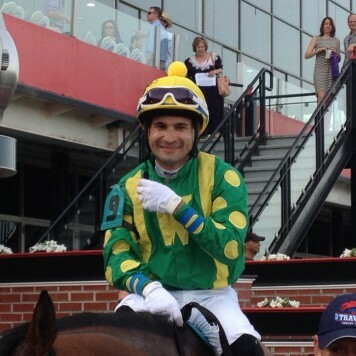 Xavier Perez smiles after guiding Talk Show Man to Henry S. Clark win. Photo by The Racing Biz. Beyer numbers gave Bodhisattiva a 90 and Jack O’Liam 84. So I guess Beyer numbers say Magee made right choice, but I disagree.